The NHL levied a five-game suspension on Montreal Canadiens forward Georges Laraque for his knee-on-knee hit on Red Wings defenseman Niklas Kronwall. 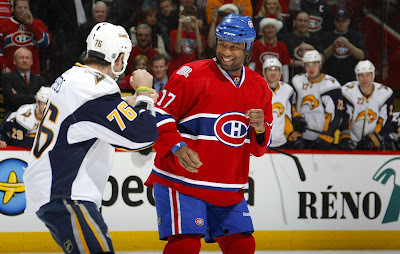 Laraque, who earlier made headlines by appearing in a "sexist" alcohol related internet ad, is known for his pugilistic play on the ice, and his soft-hearted community contributions off the ice. Although Laraque insisted that his collision with Kronwall was not malicious and that it "was a pure accident," at best it was a careless, and dangerous move. Whenever a player uses poor judgement that results in injuring an opponent, whether in anger or simple desperation, it is deserving of suspension. However, regardless of all the hoopla made over head shots this season... little gems like this Mike Richards hit on David Booth go unpunished. By comparison, Knonwall will miss some time with a severe knee sprain. Booth, who was hit on the 24th of October is still out of the lineup as a result of his non-suspension run-in with Richards. The League has drawn a line in the sand ice. No shots to the... knee; Who needs a head anyway? This should definitely work out. It might even win the big race. This helpful article will guide you in the right directions when considering the right plumbing services..